Going into our Shorty’s Well to Telescope Peak climb back in late January / early February 2014, a lot of uncertainties existed. Would the mythical spring about halfway in be a reliable source of water? Would there be snow at higher elevations? If so, how much snow would be up there? Despite the uncertainties, we knew one thing for certain: perhaps the most important element of the trip was going to occur before we even took our first steps – our gear choices. 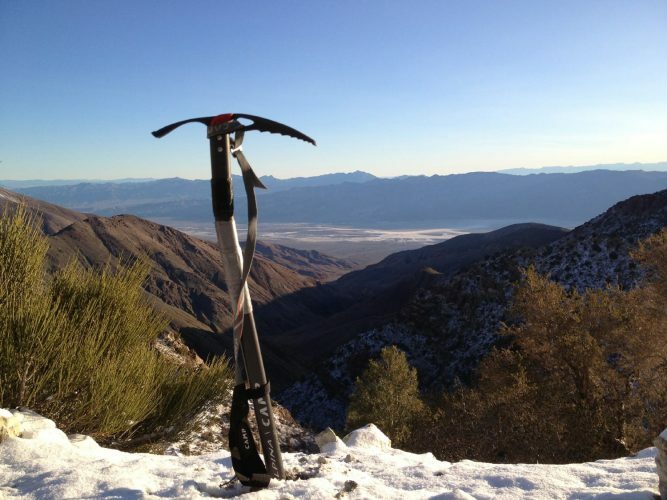 This route to get to the top of Telescope Peak is extreme in a couple of different ways. First, there is only one (supposedly) reliable source of water on the entire route. Second, the distance (round trip) is at least 30 miles. In the winter, climbers must be prepared for temperatures ranging from 75 degrees F to maybe -20 degrees F (wind chill). Any piece of gear that did not fall into one or both of those categories was to be scrutinized and, most likely, left behind. With all that in mind, here’s my gear list for a two-day winter Shorty’s Well to Telescope Peak trip. Two-person tent. Note: We shared the weight of this item. Sleeping bag rated 0 degrees F (GoLite). Small stove (JetBoil) and two fuel canisters. Note: We shared the weight of these items. Two dehydrated meals, plus cold food for the remainder of the meals. Water bottles/containers with a total capacity of six liters. I prefer to use old Gatorade bottles (or similar) on trips, they have never let me down. Poncho tarp (GoLite) for rain protection and emergency shelter. Lightweight trekking/climbing pants (GoLite) and top base layer (Under Armour). Breathable jacket / softshell (Marmot). Lightweight cap and thicker wool hat (both Under Armour). Long underwear top and bottom (Under Armour). Lightweight inflatable pillow (TETON Sports). Other smaller items on the “Ten Essentials” list and a few personal items. Snowshoes. These could be useful if a lot of snow is expected. Helmet. Rockfall is not a huge concern on this route. Goggles. Wind and temperature were not expected to necessitate the use of goggles. Microspikes. No need with crampons packed. Insect repellant or related items. Nothing. For once, I brought everything I needed.